Increase energy flow through your body, strengthen and heal muscles and joints, and cultivate a deeply relaxed state with these two styles of Qigong. Both styles are easy to learn and fun to practice! Fragrance Qigong (2nd set) consists of 15 standing postures of arm, hip, and knee movements that help bring healing to the organs and joints. 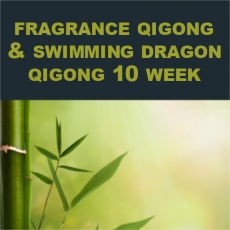 Swimming Dragon Qigong is a short sequence of gentle movements that increase flexibility of the spine, hips, shoulders, and arms as well as strengthens the core muscles. This course is offered live at the Qi Gong Instutute of Rochester and also simulcasted online. Classes are recorded and students will also have access to the recordings of each class in this series for a year after broadcast. . Session is Thursdays 1:30-2 pm beginning Feb. 21, 2019. Note: no class Mar. 14 2019.